It seems that previously published information about Ukranian tattoos was absolutely successfull. Therefore, we’ve decided to put here more videos and photos on that topic. If you have any comments or ideas about other topics of interest, please feel free share it with us. Sure thing, what exactly you’d like to get? As far as I understand you want it typed in ukrainian but I’m not sure if you have cyrillic font installed on your PC. I guess I can draw it and send to you somehow, let me know what exactly you’d like to have written? Same deal with me, my grandfather is pure Ukranian and he unexpectedly had medical conditions that instantaneously paralyzed him. I want to know what the saying “Live life to the fullest” is in Ukranian. thanks alot. hmm.. i’m not sure exact translation, sorry my english is not so good so i’d need to re-ask.. is this have a meaning of “by dying you are staying at our hearts” ? well translation sounds like “любити твою сім’ю завжди” but honestly I’ve never heard this used in Ukrainian. Probably try to explain what exactly you’d like to speak up. Could you possibly translate “No Regrets” for me please? did you design it or tattoo agency? I let the artist draw it as my artistic skills are limited. My friend passed away years ago and she was Ukrainian. I wanted to get a tattoo that somehow represented that part of her. I like the idea of words such as “strength” – as it also applies to other aspects of life. How do you translate strength in ukrainian? I would hate to get it wrong. Not as in…physical strength, but mental strength. Hi i would like to get a tattoo in ukrainian meaning “strength”. I would like it to mean strength of mind not physical. In all my searches i have found сила is this not correct? This is correct. There are synonyms like МІЦЬ, ПОТУГА, etc. But the standard one is СИЛА. like everyone above, I’m thinking of getting a tattoo of my nickname, perogy cheeks. But I haven’t a clue how to translate it into ukrainian! any help? so “perogy cheeks” is this your nickname? Can you explain what it means and I’ll try to find the closest possible translation? does, сила у сім’ю, translate to strength in family? ok, I also found сила у родина should translate to strength in family, but again I’m not sure. Thanks for the help! I am hoping you can help me. My father commited suicide a few years ago and he was very proud of his ukrainian background. I would like to get a small tattoo in his memory. I am looking for the translation of father. Hi Gabby, sorry about your father. So father in Ukrainian sounds “тато” or more official “батько” so you can use any of them. My sister and I want to get small matching tattoos to honour our Ukrainian Granddad. We want to get “Family” and have been looking on numerous translation websites which all bring up different variations. I dont have cyrillic installed on my pc, can you show me the word starting with a capital, the rest in lower case please! I’m getting married shortly and wanted to get a tattoo to commemorate both my marriage and my family heritage as I’m changing my last name. I want to get “love” in Ukrainian tattooed. I see that there are many different versions of love- can you please send me an appropriate translation? Thanks so much! I’m also looking to get a translation for a Tattoo… My Baba and Gido’s family name is ‘Hunchak’ but unfortunatly they have not writen Ukranian is decades so the talent was lost… Help please? Hi, I wanted to get a tattoo of the word love in Ukrainian but as said above there are many differnt ways to say it and spell it. I want it to be love, as in love for life? Would that be Кохання as well or люблю ? I have lived in Ukraine for two years as a volunteer and I will be here for 6 more months. I want to get a tattoo before I leave country to remember my service. Does anyone know of a good place that I can go. OR perhaps an online directory of places in Ukraine. I’ve tried googling it…but perhaps I am missing something. I am looking to get a tattoo..I want to get “love yourself” or “family” in Ukrainian. PLease help! I was just wondering if there’s one version of family that is more suitable than the other-or what the difference is? It may be a silly question but I thought it’d be smarter to ask! So based on YOUR opinion, if the tattoo is to represent the closeness and importance of family to me (mom, dad, brother, cousins, etc) which would be more appropriate? The reason I want to get it is because my grandpa who was ukrainian and all his children (aunts, uncles of mine) and all my cousins and I are very close. And I want this to represent them and their importance to me in my life. I REALLY appreciate all ur help, I just want to get it right! would you be so kind to translate…. love and happiness for me? I am at a turning point in my life where these would be appropriate words to use…. Hi, me and my older sister are wanting to get a tattoo that symbolizes us in ukrainian… nothing too cheesy, were sisters but also best friends, any ideas? we’re stumped on ideas. Just wondering if you would be able to share the translations for ‘to love’ and ‘to live’ with me? I just want to double-check the translation I currently have. a young friend of mine would like tattoo saying ‘love life’ please give me the translation. My Baba passed away a few years ago and I want to get a tattoo to remember her by. Everytime she said goodbye she would always say “I love you” in Ukrainian. Would you be able to translate that for me please. Hi! Can you tell me the difference betweeen these three words meaning “stregth” МІЦЬ, ПОТУГА, СИЛА? Hey! I was wondering if you could translate ‘happiness’ for me? I am thinking of getting a tattoo, but I definitely want it written correctly on me! Could you please translate “Sisters are flowers from the same garden” for me, my sister passed away and I wanted to get a tattoo in ukrainian in memory of her. Thank you. Leah I’m sorry to hear about your sister. Hi, i was thinking of getting a tatto in ukrainian of a religious passage or saying but am having trouble finding anything would you know of anything? I’m looking for translation of ‘You are My Sunshine’ and ‘I’ll always be your Sunshine.’ Also trying to find the lyrics to the song ‘You are My Sunshine’ already translated? Any suggestions? My Baba has just recently passed in the last few weeks and she used to call me her Sunshine and sing the song to me all the time. would you be able to translate my family name for me? Could you also translate family forever my father passed away last year and had family tattooed on his forearm in Ukrainian and for my 18th birthday i would like to get a memorial tattoo in his honor it would be greatly appreciated! Could you please translate my grandparent’s last name for me? It’s “Letchuk”. Thank you so much! Wanting to get my last name “Kunyk” down my tricep, could you please translate and also provide the Ukrainian script? hi there i lost my father a few years back. one of the lst things he ever said to his kids was “enjoy every moment. it goes by to quick.” how would this be translated into ukrainian as i would love to get this tattooed. hi there i lost my father a few years back. one of the last things he ever said to his kids was “enjoy every moment. it goes by to quick.” how would this be translated into ukrainian as i would love to get this tattooed. Would you please translate ” love yourself” for me I would like a tattoo that says this. I was looking to get a tatoo in memory of my great baba, when i was younger she always sang ‘you are my sunshine’ in ukrainian to put me to sleep. I want to do a sun with the ukrainian words for ‘you are my sunshine’ above or in the sun. Can you help me with the translation? I was wondering if there was a way to spell the name, “Kimmy” in Unkrainian? Thank You. I am very proud of my ukrainian heritage and there are 3 tattoo ideas i was wanting to have written in ukrainian and I was hoping you could give me the proper translations? Hi, im wanting to get my children’s names tattooed on me and i would like to have them in Ukrainian. My son’s name is Everett and daughter’s name is Lilly. But i would like to have them in a nice written script font. Would you be able to translate the names into a nice writing font? Thank you. I was hoping to get a tattoo in Ukrainian , either “family” or my last name “Parfeniuk” but it’s hard to find a solid answer , if you could help me out it would be much appreciated! Was wondering if you could tell me how to properly get this tattoo’d in Ukrainian? I know its long so if you cant i understand, thanks! I’m from Scotland and I have to admit ive fallen in love with the Ukranian language, i’d love to visit the country sometime and i’m considering spending a year of study in either Donetsk or Kyiv. I’d like a tattoo saying ” Daniel ” in Ukranian, I feel this would make me rather unique as everyone else seems to go for English or Japanese. I believe the translation is ” Данило ” but I just wanted to be 100% sure before I get it inked onto me. I’ve been trying to find a suitable phrase that I can dwell on in tough times. Something like “there is hope”. What are some good phrases to portray confidence and ambition? I am in the process of creating a tattoo for myself and ive come to a fork in the road. My first option is, since we all have struggles in life, I would like a suitable phrase i can dwell on in tough times. something like “there is hope”- would “надія є” be a suitable translation for this? Hi, me and my sister are planning on getting tattoos in Ukrainian that say ‘older sister’ ‘younger sister’ I was wondering if you could help me with the translation of those. Thanks! Hi, I love the website. i would like to get a tattoo in honor my Ukrainian grandmother. Either a symbol for strength, or in the rare chance you can help me…Her maiden name was Demay, I am not sure if that was Americanized or not. If you could email the Ukrainian writing of it, and any info of what it meant or origin. I would greatly appreciate it!! Thank you!!! Hi I was wondering if you could translate “i love you baba” or if you know a symbol for baba in ukrainian for me? Or if there is another phrase along the lines of love you baba or miss you baba. Any phrase along those lines would be great!! oh also could you translate “you will always be missed baba” for me please! I am wanting to get a tattoo for my baba! I would love to get the word ‘baba’ in ukranian script if you would be able to help me out? Or if there is a symbol that represents baba also. I was wanting to get a tattoo for my baba has she has passed away! I would love to get baba translated into ukranian script if that was possible? and also if there is a symbol that represents or means baba. Hello, I am looking to have a tattoo done to represent my Ukrainian grandma. My grandad taught me Ukrainian and the only thing I remember is ‘I love you’. As he recently passed I would like to get this tattooed but not quite sure of the exact translation as I have seen many. Also is there any type of symbol for love in the Ukrainian culture.! ( besides a heart )Thanks this is greatly appreciated . Can you write “don’t worry, be happy” in Ukrainian. My Gido passed away this year and he’d always tell me that. I’d love to get it tattooed on me but want it in Ukrainian writing for him and my Baba. Thanks ? Hello, I would love to gef my Childrens names, in Ukrainian put on my inner fore arm. The printing of ukrainisn is quite boxy and was hopping you could send me there names hand written in Ukraine. There names are Jessica Lee and Christina Marie. Keeping and inbetween may work, not sure thankyou!! 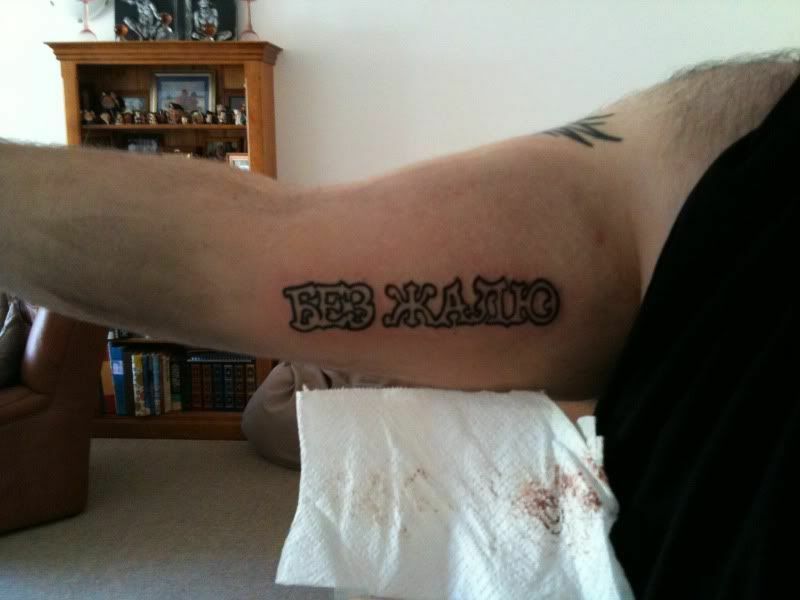 Hi I would like to get a tattoo that says I love you And the names of my family. My father is Arsen, mom is Sandy sons Nicholas and Christopher and sister Sharon. Also how would you say/write the word Freedom and are there any Ukrainian symbols for freedom? If possible I would love to know the origin of the last names of my grandparents. Grandfather Machugovskiy; Grandmother Manujlowytsch. Any help would be ver appreciated!!! Re these last names – they are definitely ukrainian ones but I really don’t know their meaning. You may need to dig into some old archives to figure it out.